Most people have heard about the cloud and the benefit it brings in the shape of pay for what you use and rapid provisioning etc… Simple right… well yes and no. Pay only for what you use. There is no minimum fee. Estimate your monthly bill using AWS Simple Monthly Calculator. The prices listed are based on the Region in which your instance is running. For a detailed comparison between On-Demand Instances, Reserved Instances and Spot Instances, see Amazon EC2 Instance Purchasing Options. But read on, and you discover you can choose between ‘free tier’ or ‘on-demand’ or ‘reserved instances’ both with different pricing models, and you can even bid to buy unused capacity in the shape of a ‘spot instance’. You’re maybe thinking that when you’ve worked this all out then you’re done… not quite. On top of this you then incur data transfer charges, elastic load balancing and Amazon S3 block storage charges. I wonder how many people pick something small and simply put their credit card details in hoping the bill at the end of the month won’t be too bad? Well, a word of advice… If you’re running a small application periodically (and remember to shut it down, because you’ll still be charged if you leave the lights on) then you’ll be amazed how little this costs. However, if you’re running a decent sized business application 24×7 then you’ll be amazed how much the costs mount up… and you might even resort to searching for the chap who told you that cloud was cheaper than owning your own hardware. There is also a MSDN Premium license for developers, but like Amazon when you get into the detail it can be complex. What’s more they offer packages in the shape of a Development Accelerator Core a Development Accelerator Extended and a SQL Azure Development Accelerator Core … Fantastic… erm no… this is confusing for a seasoned IT person. I wonder what a small or medium sized business looking to move some systems to the cloud would make of it. 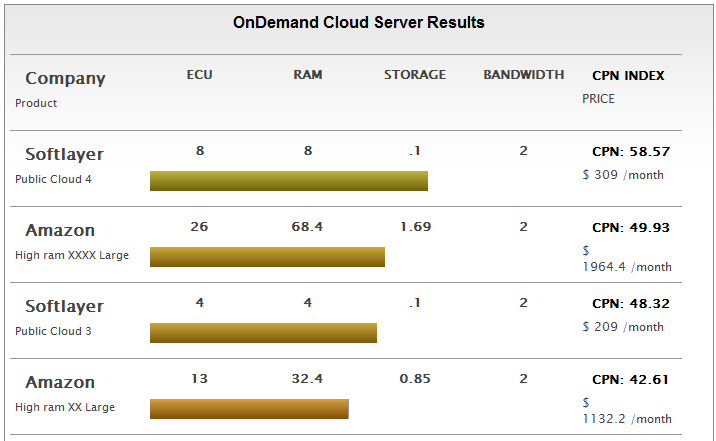 You pay for each Cloud Server (virtual instance) by the hour. For your convenience, the monthly totals are also listed here. However, on top of the basic instance you again have to pay for data transfer costs and also you need to pay for cloud files storage (similar to Amazon S3) and the cost varies depending if you run a Linux or the more expensive Windows OS. Amazon, Microsoft and Rackspace, although big names, are only a small sample of dozens of cloud providers operating today… have a look at www.cloudpricecalculator.com to see some of the others. Previous postIt’s decided… the Iphone gets one more chance. Next postAirPrint compatible printers… who needs them? Completely agree, not for everything. I think we’d all agree that transposing an on-premise app straight into the cloud would not be recommended as they simply weren’t built or optimised for that. If you’re seriously considering doing the above then you’d be foolish not to measure the on premise usage and calculate the costs prior to migration. You’d only have yourself to blame (you or your ‘consultant’) if you didn’t do that. Would also be useful to compare the cost of a physical server + install + power + cooling + HW maintenance + backup + networking to connect remote sites into central hub at reasonable level etc, the whole lifecycle of on premise ownership, to that of the equivalent servers that are costed in the screenshot above. Let’s get some proper science behind this cautionary tale. I support what you say and would like to add this isn’t a cautionary tale, I’m a supporter of the pay as you go cloud for the right purpose and have used it very successfully. My motivation was more to suggest to go into these types of cloud with your eyes wide open. Also, there is a tipping point for high volume users where the economics favour full on managed hosting as opposed to a pay as you go service. For example, I attended a cloud camp where someone who ran a cloud based spam filtering service shared a story of how they moved off pay as you go once they reached the equivalent of three physical servers, and saved money in the process thereafter. A couple of years ago I thought Amazon were going to “clean up” the webserver market with their cloud hosting technology but as you say, there are so many pit falls and small print you have to understand before attempting this platform its unbelievable (even to us geeks!). I’ve known Ross a good few years now – top bloke and knows his cloud stuff inside out. Been a few years, how are you and the family keeping? Yes, I’ve met Ross through Cloud Camp great guy, hugely knowladgeable, in fact it was his presentation about how he moved part of his business to the cloud and back again to which I refer in the post.